The Wall Street woes have officially hit just about every Main Street in America today... every one with a McDonald's at least. McDonald's is planning to take their much beloved Double Cheeseburger off the Dollar Menu. They're replacing it with the new "McDouble." The McDouble still has 2 meat patties, but only 1 slice of cheese. 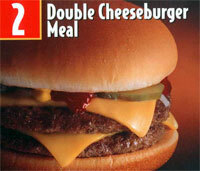 The Double Cheeseburger would still be available, but not on the Dollar Menu, it will be priced somewhere above $1. There has been much speculation lately on the fate of the Double Cheeseburger, but these appear to be the final plans as laid out in a memo to franchisees. Franchisees will vote on the plans in November. McDonald's has been testing the Double Cheeseburger changes in some markets and have found that most people prefer to keep the second piece of cheese and spend a little more. Removing 1 piece of cheese will save McDonald's about 6 cents per sandwich. Evidently the Double Cheeseburger/McDouble changes could boost cash flow by $15,000 a year per restaurant. The Dollar Menu accounts for 14% of McDonald's US sales. I suppose this was inevitable. When you sell as many burgers as McDonald's does, one piece of cheese can make a big difference to the bottom line. But it does seem odd that they couldn't make up their mind to either raise the price or cut the cheese (sorry) and instead decide to do both. Now, I guess, it will be up to us when we're in the drive-thru... more cash for extra cheese or a buck for 1 slice less? McDonald's Double Cheeseburger vs. McDouble. What will you choose? As I understand, most people would choose to pay the extra cash instead of feel shafted for getting less. But, in this very money-minded time, I think some will find that if there's less cash in their pockets, but they can still get a burger for the same price, they will be happy. I think it is a good move, at least initially. If after a period of time the public speaks up to their preference, they might be able to drop one of the two. I like the lower calorie count of the $1 McDouble. And yes, I count calories, maintain a healthy body weight, AND eat McDonald's. I eat there because I appreciate that they actually list the calorie counts on their packaging. Wait a second now! The choice is either spend $2 for a double with 2 cheeses or else $2 for two entire mcdoubles? Why is this even a question? I don't even know how long ago this happened... I think more than a year. I was a fool for the dbl chs brgr. So when it came off the dollar menu and was replaced by the mcdbl... I was confused but ordered it. It wasn't until I read that I was able to figure out what the difference was. They are the same burger... I couldn't tell what had changed. Why spend the extra money... I think having both on the menu is just a ploy to make people think they're different and buy the higher priced brgr they know they love! I like the mcdouble better, the regular double cheeseburger has too much cheese in my opinion.